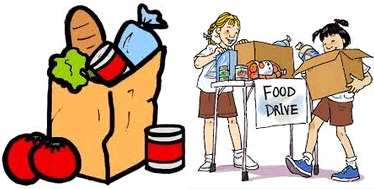 FEBRUARY IS FOOD PANTRY MONTH! In addition to supporting St. Paul’s UMC Food Pantry with groceries donated by our parishioners, we also send them monetary contributions. If you would like to do this, either on a one-time-only basis or as part of your regular contributions, you can add this easily to your pledge check (specify the amount on the memo line), or write a check to St Mark’s for the Hunger Fund/Food Pantry. You can also put cash in a specially-marked envelope. These donations are sent to St. Paul’s quarterly, and are noted on your contribution sheet. Even a few dollars on a monthly basis will help! These donations are sent to St. Paul’s quarterly, and are noted on your contribution sheet. Even a few dollars on a monthly basis will help! that St. Mark’s is the BIGGEST local contributor to the Food Pantry? When they call, we answer, both in money and groceries. as the pantry was almost completely out. which includes the loose plate on the fourth Sunday of each month. YOUR donations make a huge difference to our hungry neighbors!